Wicketkeeper, Glendeen Turtin picks up the bails as Rozel Liburd watches on after being bowled by Swayline William. In the first affair, Jamaica won the toss and sent Trinidad in to bat. The team from the twin-island republic reached 145-6 from their allotted overs. 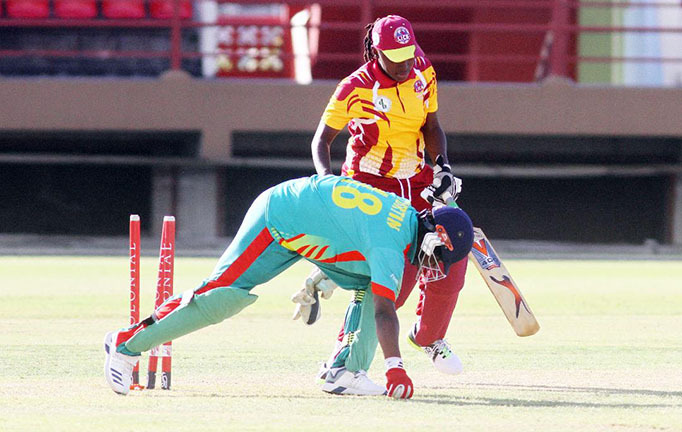 Jamaica, in reply, reached 146-3 in 18.4 overs. After a brisk 27 from Stacy Ann King at the top of the order, Trinidad’s batting centered around Britney Cooper who top scored with 30 from 27 deliveries with four boundaries. She forged a fourth-wicket partnership of 42 with her captain, Merissa Aguillera before she fell to Chedean Nation, edging to the wicket keeper…..